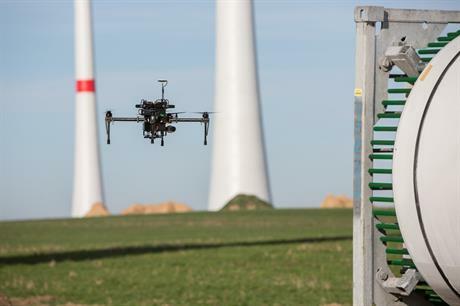 GERMANY: Turbine manufacturer Nordex has signed a deal with aviation company Lufthansa Aerial Services (LAS) to provide drone inspection services. Nordex said the deal with LAS – part of the Lufthansa group – would allow it to draw on the experience of the aviation firm, which "uses drone-assisted inspections" on its own aircraft. It is hoped the service will be rolled out across the manufacturer's global portfolio, which currently stands at 20GW of installed capacity across 25 international markets. The use of drones is becoming more prevalent in wind turbine blade inspections as its removes the need for rope access, meaning it is safe and can be done more quickly. "LAS is able to draw on the many years of experience of the Lufthansa Group in aviation, especially in the maintenance of complex systems," said Nordex's head of global service, Bo Moerup. "On the basis of the large quantity of very precise data that LAS will provide us with on the regular inspection flights, we will be able to make detailed analyses as well as optimise our turbines and our service," Moerup added.